Also, if you're thinking you've seen this cake before, don't worry...you aren't having a case of Monday brain fog. You have indeed seen this cake before, specifically in my last post. After my first crepe cake was such a hit, I knew it was just what I needed to make when Adri asked me to whip something up for our Airweave shoot. Of course, I had to put a little festive spin on it (because winter) and, instead of decorating it with big, bright flowers, I went with more simple, rustic winter woodland decor. The cranberry cake came out beautifully, if I do say so myself, and tasted even better. So much so, in fact, that I knew I couldn't keep the recipe for myself. Enjoy at your holiday parties, serve it for a festive brunch, place it out for dessert at Christmas dinner, eat the leftovers for breakfast in bed. Any which way, I promise you will enjoy it! P.S. 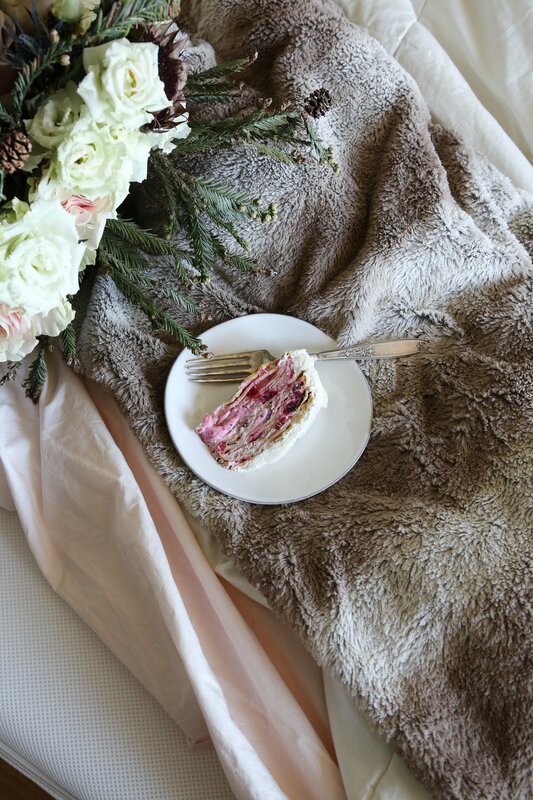 You can see the original cake feature + get some cozy winter bedroom ideas in this post. In a blender, add all of the crepe ingredients. Blend for approximately 1-1 ½ minutes (or until all the lumps are gone), making sure to stop half-way through to scrape down the sides. Place the blender in the refrigerator and chill for 30 minutes, or up to overnight. Once the batter is chilled, take a whisk and beat the batter to remove any excess lumps or clumps that may have formed during the chilling process. Over a medium heat burner, melt ½ a teaspoon of butter in a 9-inch skillet. Once the butter has melted, tilt pan to approximately 45 degree angle and pour about 2 tablespoons of batter into the skillet. Be sure to swirl the batter around in the bottom of the skillet to even the crepe out. Cook for about 45 seconds, or until you see the edges start to turn a golden brown. Then flip and cook for another 15 seconds. Once the crepe is done, place on a paper towel lined plate and repeat the process starting each time by melting ½ a teaspoon of butter in the skillet. Continue until batter has been used up. Allow them to cool completely before assembling the cake. Add the cranberries to a medium-sized pan along, along with the sugar and orange juice. Cook over medium-high heat, stirring occasionally, until the cranberries are bubbling and the sauce has reduced slightly, about 5-7 minutes. Turn the heat to medium and continue cooking, adding more orange juice or some water as needed, until the sauce becomes thick and most of the cranberries of opened. Remove from the heat and allow to cool completely before using (you can cover it and place it in the refrigerator to speed this process up). In a mixing bowl, whip the cream and sugar until soft peaks form. Transfer to a large bowl and set aside. Then, place the cream cheese in the same bowl used to whip the cream and beat it until it is soft and smooth (approximately 3-4 minutes). Add half of the reserved whipped cream back into the bowl with the cream cheese and whip at medium-low speed until the mixture is smooth and no lumps remain. Fold in the remaining whipped cream by hand, being very careful not to over-mix. Transfer half of the cream mixture back to the mixing bowl and set the other half aside. Gently fold the chilled cranberry mixture into the mixing bowl, again being careful not to over stir. Set aside. Place a crepe in the center of a cake stand or serving dish. Spoon about ½ cup of the cranberry cream mixture on top and spread it out, making sure not to go all the way to the edge (the weight from the other layers will push the filling out). Continue layering in this order, ending with a crepe on top. Frost the cake with the reserved whipped cream mixture and refrigerate until set, at least 1 hour but preferably overnight. Decorate it with toppings, if you desire, before serving. Leftover cake can be stored, tightly covered, in the refrigerator for 2-3 days, although it tastes bests within the first 2 days. The cranberry mixture (without the cream added in) can be made up to 3 days in advance and kept, with an airtight cover, in the refrigerator. The crepes, also, can be made ahead up to 3 days ahead and stored in a ziplock bag in the refrigerator until ready to use. Just be sure to let them come to room temperature prior to assembling.